This is a promotion I can get behind. 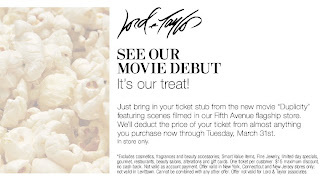 Lord and Taylor will pay me to go see a movie and, bonus, it's a movie I was going to catch anyway. Of course, they won't give me the ticket price in cold hard cash, I'll have to buy something and have the $10 (or however much it's gone up to this week) deducted from my purchase, but I can live with that. I'm sure there's something I need. Ah yes! A couple of weeks ago, I lost a glove I use when dog-walking. The weekend it disappeared the weather turned warm in NY and I thought I wouldn't need to replace it until next winter. Of course since then it's been bitterly cold and I've walked the dogs with one hand in my pocket. (Not easy to pick up poop and hold two dogs that way). I could buy myself a new pair of gloves, hopefully on sale for $10, which would make them free. Win-win*. Now what do you think is the likelihood that Lord & Taylor will have gloves for sale at the end of March? * Actually win-win-win as it gives me another opportunity to show the Lord and Taylor logo that Andrew Geller designed. You know Andy Geller, right? Designer and architect of The Cool House. That's him standing in the house, in the Cool House Photostream (left).